MELVILLE, NEW YORK, May 10, 2011 - FONAR Corporation (NASDAQ-FONR), today announced its earnings for the third quarter of fiscal 2011, ended March 31, 2011. The Company has net income for the past four quarters and net income from operations for the past five quarters. 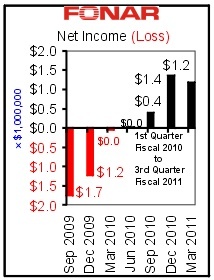 For the quarter ended March 31, 2011, net income was $1.2 million and income from operations was $1.4 million. This is compared to the same period ended March 31, 2010, when the net loss was $8,000 and income from operations was $25,000. For the nine months ended March 31, 2011, net income was $2.9 million as compared to a loss of $3.0 million for the nine-month period ended March 31, 2010. Total revenues increased 15% to $8.7 million for the three-month period ended March 31, 2011, from $7.5 million for the corresponding quarter which ended one year earlier on March 31, 2010. Total revenues for the nine months ended March 31, 2011 were $25.4 million, as compared to the nine months ended March 31, 2011, one year earlier, when net revenues were $23.2 million. Total operating costs and expenses decreased 3% from $7.5 million for the quarter ended March 31, 2010 to $7.3 million for the quarter ended March 31, 2011. Significantly, revenues from the management and other fees segment (management of the ten FONAR UPRIGHT® Multi-Position™ MRI diagnostic imaging centers segment) increased 46% from $2.7 million for the three months ended March 31, 2010, to $4.0 million for the three-month period ended March 31, 2011. As of March 31, 2011 total current assets were $17.0 million, total assets were $26.4 million, total current liabilities were $24.3 million, and total long-term liabilities were $2.8 million. As of March 31, 2011, total cash and cash equivalents and marketable securities were $2.4 million as compared to $1.3 million as of June 30, 2010. As of March 31, 2011, the total stockholder’s deficiency was $781,000 as compared to a total stockholder’s deficiency of $5.8 million as of June 30, 2010, an improvement of $5.0 million. On October 14, 2010, the Company received a notice of non-compliance from The NASDAQ Stock Market, LLC, based upon NASDAQ Marketplace Listing Rule 5550(b)(1) which requires a minimum stockholders’ equity requirement of $2.5 million for continued listing on The NASDAQ Capital Market. A hearing was held on March 17, 2011, and subsequently the NASDAQ Hearings Panel granted the Company an extension until May 11, 2011 to complete a newly proposed financing and regain compliance with the stockholders’ equity requirement of $2.5 million. The Company commenced a private placement of equity and succeeded in raising $6 million by May 2, 2011, which amount was more than sufficient to eliminate the stockholders’ deficiency of $781,000 as of March 31, 2011 and achieve compliance with the stockholders’ equity requirement of $2.5 million. As of March 31, 2011, FONAR has now installed 150 FONAR UPRIGHT® Multi-Position™ MRIs. The 150th was installed in Hamburg, Germany during the recent quarter. It is the fourth UPRIGHT® MRI installed in Germany by Medserena, AG. At the time of the sale, Matthias Schulz, CEO of Medserena, said, “The first three UPRIGHT® Multi-Position™ MRI centers have had great success. With physicians all over Germany asking about this technology, it has become imperative for us to expand and install a fourth FONAR UPRIGHT® MRI scanner. This, is in spite of an intensely active MRI market in Germany, where there are already many conventional lie-down MRIs installed. “The large number of requests coming from our physicians in Germany,” said Mr. Schulz, “are arising because of the special medical need for FONAR’s unique technology. “The German people tend to recognize the potential of any new technology quickly. We have been very successful in Germany with the FONAR UPRIGHT® MRI and its power for scanning patients in multiple UPRIGHT® and recumbent positions because our physicians have quickly appreciated the benefits of this new technology and want their patients to have access to those benefits as soon as possible. “At this time, all of the segments of our business are strong. Significantly, the management of the ten UPRIGHT® Multi-Position™ MRI centers has given us steady profitability that we can rely on regardless of the state of our economy. A major reason for our profitability has been the cost-control measures that we have taken and which continue to yield results. We are pleased with our accomplishments and plan to continue capitalizing on building a strong business and increasing shareholder value,” said Dr. Damadian.